As Ford’s revamped Edge SUV hits showrooms this month, the crossover touts more than just its new ST performance badge – it enters the market as an underrated yet compelling adventure vehicle. On paper, its upgrades pit it toe-to-toe against more expensive and equally capable crossovers. As Trucks.com drove from Salt Lake City to Park City, Utah recently, spinning through a series of mountain back roads, the improvements were evident. The sum of its parts quickly proved the Edge’s capability. Though Ford didn’t design the Edge ST to appeal strictly to the outdoorsy crowd, many of its upgrades are worthwhile for any weekend warrior. With features like best-in-class rear storage and a maximum towing capacity of up to 3,500 pounds, the Edge ST has adventure in its DNA. Even with the rear seats situated upright, the Edge ST offers 39.2 cubic feet of cargo volume – perfect for several tents, camp stoves, camp chairs or coolers. 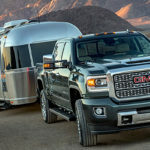 When the rear seats are lowered, its cargo capacity balloons to 73.4 cubic feet, capable of holding one or two mountain or road bikes, in addition to camp gear. However, the vehicle lacks rubber mats for the cloth-lined cargo area. Not only would mats save breaking out the steam cleaner after a muddy mountain bike trip but they’d go a long way in preserving the integrity and quality of the vehicle. Loading and unloading on rubber is easier as there’s less to be caught up in pedals, zippers or chains. Aside from its large storage capacity, another plus is its standard tow hitch. Be it fishing or wakeboarding boats, dirt bikes, or snowmobiles, the stated 3,500-pound capacity offers a wide range of towing options. All-wheel-drive is one of the most important features for any adventure vehicle – it’s the difference between traversing an icy pass or staying home for the weekend. With the new Edge ST, Ford’s debuting a tech-centric approach to AWD called all-wheel-drive disconnect. In essence, AWD disconnect relies on artificial intelligence and dozens of sensors to continuously determine whether AWD is required or not. Without any input from the driver, the system automatically shifts (within 10 milliseconds) between AWD and FWD depending on its assessment. Aside from providing proper traction control, Ford also designed this to conserve fuel. AWD disconnect works in tandem with the Edge ST’s traction control system. As it detects wheel slip, it communicates with the vehicle’s anti-lock brake system to determine when AWD is needed. The tech also detects outside temperature, whether the windshield wipers are on and if there’s a trailer attached. When it comes to performance, the Edge ST goes beyond what’s offered in the 2018 Ford Edge Sport. With a specially-tuned twin-turbocharged 2.7-liter EcoBoost V6 engine, the vehicle offers 335 horsepower and 380 pound-feet of torque. But that’s going to cost at the pump. To unlock that performance from the Edge ST, drivers will have to run premium-grade fuel. Although it runs fine on regular unleaded fuel, Ford only shared data pertaining to premium. Features such as its eight-speed automatic transmission, sport suspension and steering, selectable traction control and dynamic handling give it more performance capability than any Edge before it. When tuned to Sport Mode, throttle response and shifting become more aggressive, holding gears near redline levels while cornering. Switching to this mode is done by simply pressing the “S” button located on the transmission dial. Sport Mode also manages traction control in four levels: Off, Normal, AdvanceTrac Sport/Track and AdvanceTrac Off. The automaker’s driver-assist system, Ford Co-Pilot360, makes its debut on the Edge ST. Co-Pilot360 includes pre-collision assist and automatic braking, blind spot and cross-traffic alerts, lane-keeping, a rear backup camera and auto high-beam headlamps. Pre-collision assist allows the Edge ST to automatically apply the brakes in the event of an emergency – and it’s effective, too. On a closed course with a balloon dummy some 50 feet away, Trucks.com gassed the Edge ST to 20 miles per hour right at it. As the Edge ST neared the dummy, the vehicle began to slowly brake, offering the driver the ability to apply more braking pressure. Absent of that, it does the work itself. Pre-collision assist effectively slammed on the brakes and stopped the car a mere foot away. The Edge ST will stay completely braked until the brake is pressed or the vehicle is put into park or drive. The rest of the Co-Pilot360 package works as advertised. Active blind-spot alert notifies the driver of any vehicle not visible in rearview mirrors. The backup camera is useful when parallel parking or backing out of a parking spot. One of the best features, however, is its lane-keeping and lane-centering system. With lane-centering, available via the Co-Pilot 360 Assist+ package, the Edge ST practically drives itself in some situations. Activate adaptive cruise control and the ST uses exterior sensors to locate and stay centered within a road’s lane markers. Though this won’t work for winding drives, it did prove helpful while on the highway. It’s even capable of self-steering around slight curves, all while positioning the vehicle in the center of the lane. Adaptive cruise also lets the driver set a desired cushion between the vehicles in front and automatically accelerates or brakes to maintain it, depending on traffic. It’s especially useful in stop and go traffic and long weekend road trips. With contoured leather seats, a near full-length sunroof and in-dash navigation powered by its new Sync 3 infotainment center, the Edge ST offers an enjoyable ride. Comfort isn’t necessarily the first thing someone might look for in an adventure vehicle, but it’s vital for longer trips. The Edge ST’s back seats were also comfortable and spacious. Sync 3 has improved functionality compared with previous iterations. It offers smooth navigation and clear directions even when cell service isn’t at full strength. The Edge ST also offers Apple CarPlay and Android Auto compatibility for those who don’t want to rely on Sync 3. The test vehicle arrived with Sirius XM radio and in-car WiFi via Sync 3. Each require separate subscriptions. Adding extras like a bike or snowboard rack is one way to make the Edge ST an even more capable adventure rig. While there’s plenty of interior cargo room for loose gear, strapping a bike or set of skis to a roof or tow hitch rack keeps everything organized and cleanly separated. Both crossbar or tow hitch racks are sold separately and determining which to buy comes down to personal preference. For those preferring crossbar racks, the Edge ST stands about 5.7-feet tall. Accessing the roof would require a step stool or a tall person. Tow hitch racks offer easier access but take away the ability to tow. Aside from a rack system, outfitting the interior with rubber mats in the rear cargo area and along the floor is recommended. Rinsing off a rubber mat with a hose is much easier than scrubbing mud out of carpet. With a base price of $42,355 before destination, the Ford Edge ST is no drop in the bucket. However, it is the only midsize performance utility vehicle that costs less than $43,000. The model tested came to about $46,000 before destination, thanks mostly to the Performance Brake package upgrade. The package costs $2,695 and features upgraded front brake rotors, performance brake pads, Pirelli P Zero summer tires and red calipers. These aren’t entirely necessary for the everyday adventurer. Trucks.com suggests the Co-Pilot360 Assist+ upgrade instead. For $795 it comes with the lane-centering, blind-spot monitoring, navigation and adaptive cruise control, as well as the stop-and-go features listed above. Fully-optioned Edge STs run just north of $50,000, placing it among luxury competitors like the Audi Q5, Mercedes-AMG GLC43, Jaguar F-Pace S and others. The Edge ST is available now. Editor’s note: To facilitate this report, Trucks.com attended an event where Ford hosted travel and lodging. Photos courtesy of Ford. I’m buying one. I’m struggling with the value of the “performance brake package”. It consists of the “performance” brakes (painted red, presumably not Brembo) and ONLY with summer only tires, Ford won’t even custom build one without the summer tires, which here in PA have to go right now to live in the shed till April. Dealer won’t trade them off either. I don’t think I’ll be needing anything higher than the presumably V rated 21″ that come on the 401A upgrade. QUESTION. for the $2500 upgrade cost, how much of that do you think is brakes, how much is the upgraded summer only tires. And will I even be able to tell the ride difference with the tires in this SUV? Thoughts?